“Trust in God and Do the Right” is the motto of his life. This unshaken faith has worked untold wonders in the life of the man who, by his chain of Hotels, has linked the three strategic points of South India: Madras(Chennai)- the gate way to the South; Mysore- Cultural Capital of Karnataka, the Tourist’s Paradise; and Ooty- The Queen of Hill Stations. 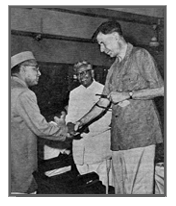 Starting from humble beginnings Shri Seetharama Rao, independently built-up a number of catering concerns to serve the travelers, tourists and the public at large. These concerns were developed into a wonderful chain of Magnificent Hotels by the creative skill and imagination of Shri Rao who has been aptly described by the many distinguished personages as the Hotel King of South India. The hotel industry in India has a western tradition. Before the British we never thought in terms of Panthasalas or Dharmasalas. 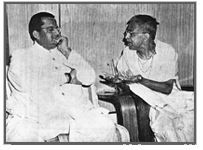 Shri Seetharama Rao’s biggest contribution to the industry was to make his hotels truly Indian in contemporary Style. An Indian would be satisfied with Indian food if he were given the quality food he expects at home in the same pure and hygienic condition. His Highness the Maharajah of Mysore, deeply engrossed in a point being explained, by Shri K. Seetharama. 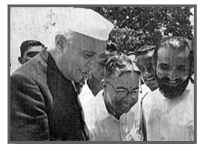 Rao, at Dasaprasada, Madras, on 09-07-1967. Dasaprakash® which means “Light of the servant of god” was founded in the early 1920’s by this great visionary in honor of his father who was indeed a true servant of god. A line of business long held to be only a means of making money. became in the hands of Shri Seetharma Rao an instrument of service and an agency for the spread of Indian Dharma and culture. Dasaprakash, with has outposts in Delhi and the U.S. has been a aptly described as a home away from home by one of its distinguished visitors.